There are many good reasons to loathe “Gangnam Style,” the music video that has become the most popular product of the global pop-culture industry. As of the first day of this month, the Youtube clip of the song, in its original rendition by the until-recently obscure South Korean performer named Psy, had more than 600,000,000 views (or clicks). But the mere fact of its popularity is not in itself proof of its loathesomeness, any more than the once-awesome popularity of my first high-school crush, Mary Ellen, was a legitimate justification of my resentment of her. All of us driven by adolescent delusions of exceptionalism should welcome, rather than reject, phenomena of mass popularity; we need them, if only to be able to define ourselves by our exclusion from their aura. More importantly, in the case of “Gangnam Style,” there is at least one reason to applaud the thing on intellectual grounds. The reasons to hate the video are obvious and well documented in Youtube user rants. Goofy, obvious, and juvenile, “Gangnam Style” glories in the most ephemeral values of the social-media age. It is instantly communicative; one gets it within literally two seconds of viewing time. There is no need to watch the clip to the end, and in fact, no incentive. At the same time, the sheer goofiness of its pleasures gives it a kind of short-term durability. The clip is made for multiple viewings in two-second bursts. It’s tweeting in audio-visual form. Also, “Gangnam Style” is as easy to imitate as it is to grasp. 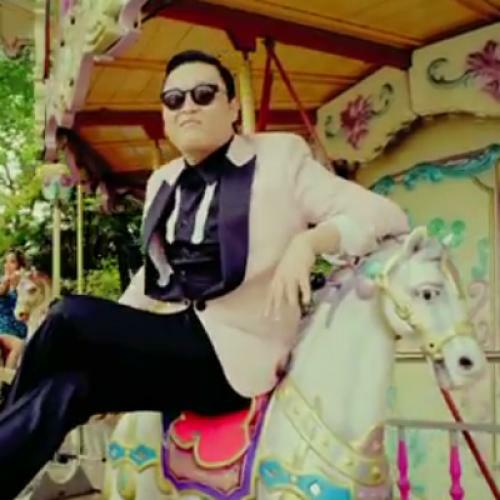 Centered on a maddeningly infectious musical hook (“Oppa Gangnam Style!”) and a preposterous phantom-horse-riding dance (seemingly adapted from Agnes DeMille’s “Rodeo” for a pre-school movement class), the video is ideally suited to the making of the parodies and mash-ups through which original works and user-generated content conspire to construct the early 21st-century version of hitdom. Made by a cagey, seasoned South Korean writer-performer who had spent some of his college years in the United States, “Gangnam Style” is itself a parody—a sly manipulation of pop and hip-hop cliches (interchangeable school-girl dancers, symbols of masculine prowess such as speedboats and thoroughbreds) in the name of a previously undocumented style named for a district in Seoul that’s the rough equivalent of Rodeo Drive. What better for the Korean Rodeo than a horsey dance? Psy, a pillowy guy in shades and a ’70s poly tux, does an act of pan-Pacific pop-culture minstrelsy, affectionately mocking both the macho posturing of male American hip-hop acts and the industrialized pretty-boy images of K-Pop, the highly regimented commercial music of Korea. Psy makes plain that he knows that “Gangnam Style” is ridiculous, and its ridiculousness is the very reason a thinking viewer should admire it. The video’s idiocy is essentially a critique of conventions ingrained in mainstream hip-hop and K-pop. Psy’s joke is a smart one that looks and sounds dumb, a joke made not on the viewer, but on the countless pop hits that “Gangnam Style” has displaced on the pop charts in the United States, Korea and the rest of the world.